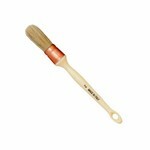 / Bristle Sash Brush, Domed, 7/8"
Bristle Sash Brush, Domed, 7/8"
These brushes are a treat to use and carry a large amount paint or wax. The handle is designed for comfort and control. The bristle head is dense and held in place by a brass ferrule and epoxy glue. A well balanced, economical, multi-function brush.